In August 2008, I visited in the Wales Springs region of Second Life a fantastic sculpture by Suzanne Graves. 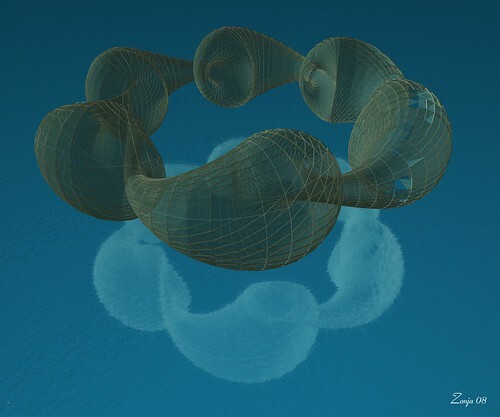 The sculpture reminded me of a Klein bottle [indeed, technically speaking Ms. Graves’ surface is not Klein-like, because it has an odd number of curls], and I decided to try to write a script to generate Klein bottles (you can find the script in the appendix at the end of this post). Since the bottle existed in Second Life and consisted of thousands of prims, it could not be linked into a single object. The bottle stayed there several months, and when the Openspace fiasco started we had to concentrate in a single island and I had to delete it because Condensation Land got cramped and Second Life has a 15,000 prim limitation. When I migrated the Condensation Land archipielago to Opensim, I was not able to migrate the bottle, because it was not linked. I still had the program, though. Some tests I made when testing the brand-new Rezzable Private Grid Alpha indicated that the script could not be run unchanged (I tried to run it and brought the sim to its knees :-/). But now I was the owner of my own grid, and could look at the Opensim console while working with the script, so that I could see if something was going wrong, stop the server, etc. And the Hippo Opensim viewer, since version 0.5.0, allowed linksets larger that 256 prims! I absolutely wanted to test this feature and see what could I do with it. I had to adapt my Klein bottle generator for Opensim — the technical details are in the Appendix at the end of the post. Once the generator had run (which took around two hours), I had a collection of 2888 unlinked prims, i.e., the bottle itself (2880 prims), and 8 prims that had beed doubly generated because of a small bug in the program. I then created a central transparent prim destined to serve as the root prim, and started to link the vertices to the root prim. What seems to be happening (this is all inference, I have not looked at the code)? Well, it appears that if you link “n” prims to an existing linkset, this is equivalent to recreating the linkset “n” times, one for each newly linked prim. This is not a problem when the existing linkset is small and the number of prims is also small, but if you’re attempting to link, say, 300 new prims to an existing linkset of 2000 prims, this involves 300 recalculations of a linkset averaging 2150 prims, and this is too much for the client, which hangs miserably. To the contrary, if you’ve got two large linksets and you try to link them, there’s only one recalculation operation for the new linkset. And this operation, albeit slow, occurs in a lapse of time small enough so that the client does not crash. Here is the code for the scripts (I’ll post a link to a downloadable version of the code as soon as I find some time) [Update:] including links to the downloadable source. The main script goes inside a standard cube, and works in the following way: a Klein bottle is a bidimensional surface immersed into a 3D space; apart from an irrelevant twist, it can be considered as the product of two circumferences, and therefore it can be parameterized using two variables “u” and “v”. Some formulas I found at Planetmath calculate the corresponding 3D points taking “u” and “v” as an input. We generate only the edges (each edge will be a prim; the code for generating the vertices is commented out; I didn’t figure how to generate the sides). Since we are parameterizing in “u” and “v” and we can only generate a finite number of prims, we have to decide on how many partitions of 2*PI we’ll use for “u” and “v”. These are the “m” and “n” variables of our program. In our example, we generate 120 partitions of “u” (the “slices”) and 8 partitions of “v” (the “stripes”). The program calculates the vertices, and then computes the positions of the edges; the edges are generated by rezzing a small prim (“Cylinder”), which is then rotated, resized and colored; part of this job is done by a small script residing inside “Cylinder”; the script auto-deletes itself on completion. The drawLineSegment routine I cannibalized from somewhere, but I didn’t write the reference [ I know, I know! :-) If someone knows the reference, I’ll happily include it here] [Update] http://lslwiki.net/lslwiki/wakka.php?wakka=LibraryBezierCurveDemo (thanks, Trevor! :-)). Please note that I had to insert a llSleep call after each rezzing — otherwise XEngine starts to choke, compilation starts to fail, and the bottle generation aborts. This is the small script that goes inside “Cylinder”. // Modified by Lionel Forager 29-12-2006: Added segment drawing between points. Corrected minor bugs. I have been using this Bezier script and pieces of it for lots of things. Very cool, id love to get a copy of these scripts when they are available. @Trevor: Many thanks for the reference! :-) I’ll update the post accordingly. I’ll try to make an oar with the bottle and the generator and post it to rexxed when I find some time too. I used your code and was able to rez the 2889 prim object in both Second Life and in the Reaction Grid Open Sim. Second Life did not require a sleep delay. Reaction Grid required a 3 second delay in order to fully rez all 2889 pieces. I then tried to confirm that you can link the object into one link set in open sim. It was exceedingly difficult, but after many attempts and many crashes I did succeed with that. Manipulating an almost 3K prim object is hard on the RAM, but I plan to try to stretch and rotate the object in RG. Meanwhile, I am attempting to alter the script to scale the object up at rezzing, which would save on the stretching attempt. This is a bit difficult the way the script is written, but I will keep you posted on that attempt. The script is a quick and dirty hack to get the job done. Many thanks for trying it, and for reporting back here!